"A beautifully detailed spy tale with an original plot." Milo Weaver is struggling to keep himself sane and his marriage alive when he finally catches up with the ‘Tiger’; a man responsible for assassinating a number of seemingly unconnected targets. The Tiger's deathbed request leads Weaver to doubt his closest colleagues and threatens to unravel his CIA office of Tourism. In a world where your life can be ended by a phone call and no one can be trusted Milo Weaver must keep himself alive while putting together a jigsaw of unrelated facts that few want revealed. In Olen Steinhauer's explosive New York Times bestseller, Milo Weaver has tried to leave his old life of secrets and lies behind by giving up his job as a "tourist" for the CIA--an undercover agent with no home, no identity--and working a desk at the CIA's New York headquarters. But staying retired from the field becomes impossible when the arrest of a long-sought-after assassin sets off an investigation into one of Milo's oldest colleagues and friends. With new layers of intrigue being exposed in his old cases, he has no choice but to go back undercover and find out who's been pulling the strings once and for all. 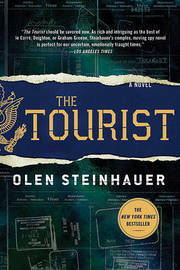 In The Tourist, Olen Steinhauer--twice nominated for the Edgar Award--tackles an intricate story of betrayal and manipulation, loyalty and risk, in an utterly compelling novel that is both thoroughly modern and yet also reminiscent of the espionage genre's most touted luminaries. Olen Steinhauer is the author of the bestselling Milo Weaver series, including The Nearest Exit, and a series of widely acclaimed Eastern European crime novels, which include The Bridge of Sighs, The Confession, 36 Yalta Boulevard, Liberation Movements, and Victory Square. He is a two-time Edgar Award finalist and has been shortlisted for the Anthony, the Macavity, the Ellis Peters Historical Dagger, and the Barry awards. Raised in Virginia, Steinhauer lives with his family in Budapest, Hungary.